The use of novel and often expensive drugs offering limited survival benefit in advanced disease is controversial. Treatment recommendations are influenced by patient characteristics and trial data showing overall response rates (ORR), progression-free survival (PFS) and overall survival (OS). PFS is frequently the primary outcome in licencing studies. As part of a longitudinal study Assessing the ‘VALue’ to patients of PROgression Free Survival (AVALPROFS), oncologists completed checklists at baseline following consultations with patients. Questions probed perceived clinical benefits of the drugs to populations in general. 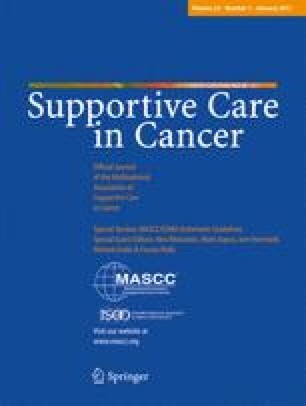 Patients completed study-specific interview schedules at baseline, 6 weeks into treatment, and at withdrawal due to toxicity or progression. Patients also completed tumour- and treatment-specific quality of life questionnaires monthly for their time in the study. Only baseline results are reported here. Thirty-two UK oncologists discussed management options with 90 patients with heterogeneous advanced cancers. Oncologists’ estimates of medical benefit in general from treatment varied between 10 and 80 %. They expected 46/90 (51 %) of their patients to derive some clinical benefit from the prescribed treatment but were either unsure or expected none for 44/90 (49 %). Predictions of life expectancy were variable but 62 % (56/90) of patients were expected to survive longer with treatment. A majority of patients 51/90 (57 %) had ‘no idea’ or were ‘unclear’ what PFS meant and 45/90 (50 %) thought extension of life was the primary therapeutic aim of treatment. Discussions between doctors and patients with metastatic disease about future management plans and likely therapeutic gains are challenging. Factors influencing decisions about putative benefits of novel drugs are often applied inconsistently can be overly optimistic and may even contradict published data. The online version of this article (doi: 10.1007/s00520-016-3408-7) contains supplementary material, which is available to authorized users. We wish to thank all the patients who gave up their time to participate in the research, and also the oncologists, research nurses and trial co-ordinators. In addition, we would like to thank Angela Fry for her assistance with administration and Boehringer Ingelheim for the funds to conduct the study. Written consent was obtained prior to the initial interview, which took place within 2 weeks from the consultation with the doctor. Lesley Fallowfield has received grant funding and speaker honoraria from Boehringer Ingelheim.